Congratulations to our 10 competitors that won 20 medals (including 6 gold)! 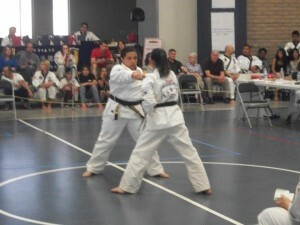 On Saturday March 23, 2013, ten Desert Taekwondo students participated in at the 13th Annual World Dang Soo Do National Tournament held in Tucson Arizona. There were 5 black belts, 1 red belt, and 4 blue belts ranging from age 7 to 33. They won: 6 gold, 8 silver, and 5 bronze medals! Students won 20 medals in various divisions: Forms, sparring, speed breaking, weapon forms, team forms, and jump front kick. 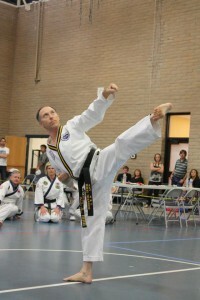 In the middle of the tournament Master Malm did a demonstration consisting of the form – Moon Moo, weapon form – Odo no sai, breaking – triple front kick and 7 foot high jump hook kick! 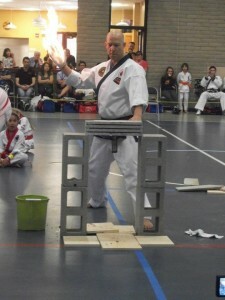 There was also demonstrations by Success Martial Arts and Master Pumarejo doing various things, including a very cool granite break with his hand lit on fire! A fun and exciting time for everyone including the family and friends that came to support all the competitors.